The Lenco-MD is the world's first 3D-printed modular turntable | What Hi-Fi? Don't worry, you don't need to own a 3D printer to own this deck. But if you have got one, now's your chance to print your very own turntable, designed - up to a point- to your own specification. The Lenco-MD claims to be the world's first such record player. It can be printed at home and offers a range of swappable modules for personalising the design. And if you like the idea of a modular deck, Lenco can do the 3D printing bit for you. The Lenco-MD is currently a Kickstarter campaign, aiming for $50,000 funding before it hits production. It's a collaboration between turntable manufacturer Lenco - responsible for the four-star L-85 budget turntable - and 3D printer producer, RepRapUniverse. Like the L-85, it's available in a range of bright colours, with more colour options promised. The belt-drive deck has a built-in phono stage, RCA output and a headphone connection. There's a specially-designed tonearm and it ships with the AT3600 Audio-Technica cartridge. As for the modules, they're set to include a solar-charging battery and a wireless Bluetooth module. More are promised. Is this the start of a trend? Lenco hopes so. 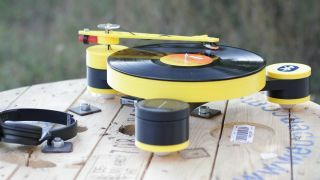 The company plans to launch an online community for owners to share turntable designs and ideas for modules. But first, it needs to hit its Kickstarter total. You can back the campaign with a pledge of just $99, which gets you the kit to print from home, while $199 gets you the deck already built. Head over to the Lenco-MD Kickstarter to find out more.